What’s Your Path to NVMe? 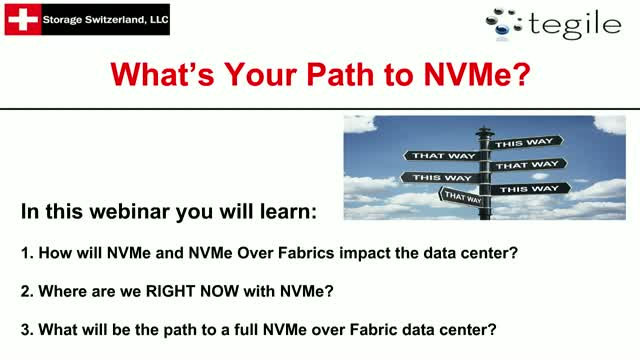 NVMe and NVMe over fabrics promises to change the flash and networking industry. NVMe enables storage systems to tap into the full potential of flash storage and NVMe allows those systems to deliver in-server latencies. NVMe will fundamentally change storage. Are you ready? Join Storage Switzerland and Tegile for this webinar as they provide you with a path to NVMe. NVMe enables storage system vendors to once again raise expectations on the performance capabilities of all-flash arrays. NVMe provides a higher command count, greater queue depth and leverages the PCIe interface to deliver a significant increase in IOPS potential with a corresponding reduction in latency. NVMe though, brings with it some confusion about who can best benefit from the technology and what are the right steps to implementing it. - Can “regular” data centers benefit from NVMe or just companies specializing in AI? - Does NVMe have to be end-to-end for data centers to benefit? - Do features such as deduplication and compression impact performance? - Does NVMe Flash mean that SAS Flash is no longer relevant? Title: What’s Your Path to NVMe?